You may have noticed the reports in the media of a University of Washington study announcing that Global Warming is causing rising temperatures in Antarctic. Anthony Watts at Watts Up With That posts an e-mail from a NASA Meteorologist, Ross Hayes, stationed in the Antarctic to the lead author of the study, Eric Steig. The full text of the e-mail is found here. 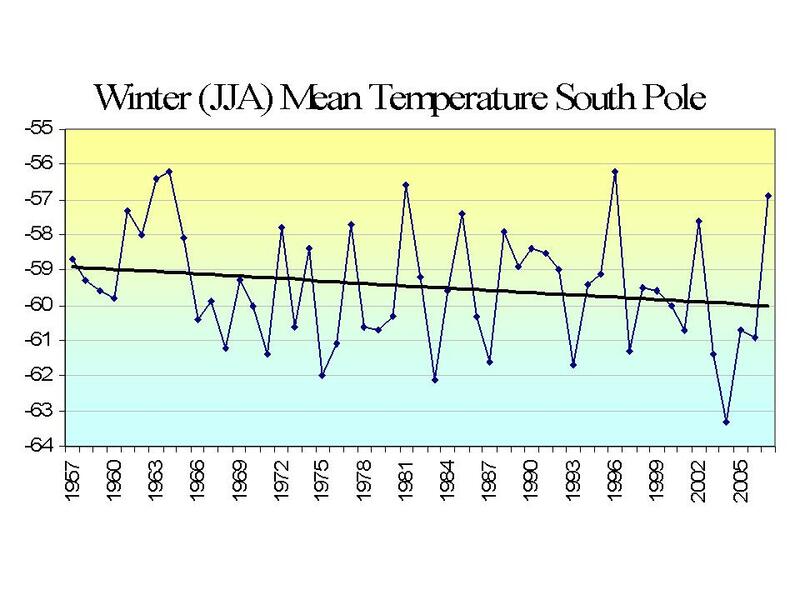 The pattern in the troposphere has reflected this trend with more maritime (warmer) air around the Antarctic Peninsula which is also where most of the automated weather stations are located for West Antarctica which will give you the average warmer readings and skew the data for all of West Antarctica. So, the weather stations in West Antartica put a thumb on the scale when measuring temperature. We will come back to this further down. The warming that the study posits over the past 25 years? .25 degrees celcius — One quarter of a degree. The warming estimate for 50 years? One degree. That is what we call statistically meaningless. As you can see, what we have here is a negative warming trend. ...what the computer had been programmed to do, by a formula not yet revealed, was to estimate the data those missing weather stations would have come up with if they had existed. In other words, while confirming that the satellite data have indeed shown the Antarctic as cooling since 1979, the study relied ultimately on pure guesswork to show that in the past 50 years the continent has warmed – by just one degree Fahrenheit. One of the authors of the study is the infamous Michael Mann who created the even more infamous "hockey stick" chart that is now widely recognized as being a complete fabrication. Don't hold your breath waiting for the media to correct all those headlines. Do expect our new President to continue talking about the "yoke" of Global Warming. It is a yoke, a really bad yoke.